Thanks to inspiration from K-Keys by KE3C and KTune by G4ILO and a prod from Pete 2E0SQL I decided to have a go at implementing control of the Elecraft K3 from the Countour Design ShuttlePROv2 device. Primarily marketed as a video-editing controller the shuttle has a number of buttons and a jog-wheel and fast-forward/reverse controls. I found that although K-Keys worked with the keyboard it wouldn’t respond to the ShuttlePRO keystrokes. KTune was designed with a different USB knob in mind – the Griffin PowerMate, which does not have any buttons available for anything other than tuning the main VFO. 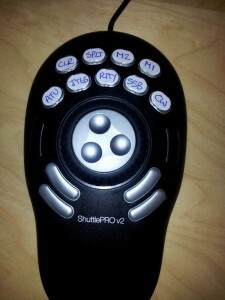 ShuttlePROv2 Controller, labelled up with new K3 functions. Each function has been hard coded to a key combination which works from either the main keyboard (though they are obscure keys) and also from the ShuttlePRO configuration utility. Set up take s a little time, especially as there are 14 key combinations to configure just to achieve the variable rate tuning. The controller has been configured for left hand use, as my right hand is usually being used for sending CW with the paddle, and the mouse is also on the right of the keyboard. Comms to the K3 is done via N8LP’s LP_Bridge software on a virtual serial port. To configure the ShuttlePRO driver I had to manually remove all other software definitions that it contains and define only global hot-keys. 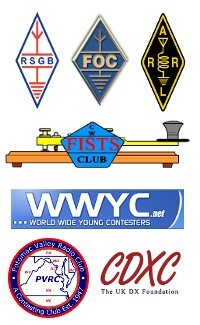 Road testing is underway while I am active on the bands. The next phase is to try and implement a GUI for serial port configuration, and eventually to allow custom macros to be configured to particular keystrokes and hence ShuttlePRO buttons. As I have reached the point that I need for my own use further development will be done on an ad-hoc basis, but if you are interested in this script for modification or the .exe file it will run from then I have included it below. Feel free to contact me and it might give me motivation to implement new features. K3_Macros_0_5 – Be aware that this script and executable is provided with no warranty or guarantee and the author is in no way responsible for the use thereof. Extract to the folder C:\m0pcb\ as this is where the enclosed DLL must be placed. The serial port expected is COM12 at 38400 Baud. Updated on 03/03/2013 to v0.5, now with improved serial interfacing so the script now works with VSPE as well as LP-Bridge.